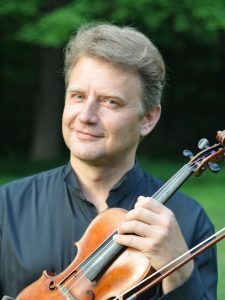 Violinist Alexander Abayev will perform Antonio Vivaldi’s The Four Seasons with the Symphony of Westchester at Iona College on Sun., Dec. 16, 2018, at 3:00 p.m. The All-Baroque program also includes J.S. Bach’s Air from Suite no. 3 BWV 1068 in D major and Brandenburg Concerto no. 3 BMV 1048 in G major. In addition to being the Symphony’s concertmaster, Abayev performs as a soloist and chamber musician in the United States and abroad and participates in many international music festivals. The Symphony’s concert season continues on Sun., Feb. 3, 2019 at 3:00 p.m. with its annual Family Concert, featuring concerto competition winners, student composers and family-friendly ticket prices. On Sat., May 5, 2019 at 8:00 p.m., the Symphony of Westchester concludes its season with an all-Romantic program featuring violinist Tessa Lark. All concerts are at Iona’s Christopher J. Murphy Auditorium, 715 North Ave., New Rochelle. Ticket prices are $50 general admission, $35 seniors (65+) and $15 students with ID. Single tickets and subscriptions are available on-line: http://www.thesymphonyofwestchester.org or by phone: (914) 654-4926. More information is available on the website or by emailing [email protected]. This entry was posted in Press Releases and tagged Abayev, Bach, Baroque, Brandenburg, classical, Vivaldi. Bookmark the permalink.